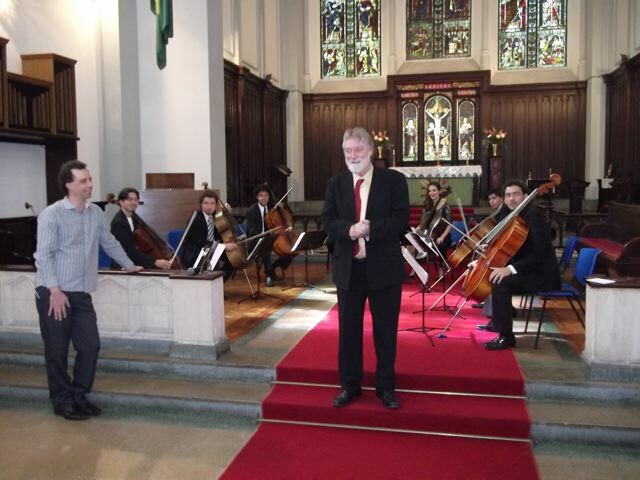 Christ Church will, once again this year, welcome participants in the Rio International Cello Encounter, founded 21 years ago and still headed by David Chew, OBE. This year’s concert will begin shortly after 12 noon on Sunday August 16th. It will feature a trio of Margaret Carey on viola, Eric Alterman on cello and Roberto Lopes on violin. Entrance is free, the acoustics are excellent, and the music divine. The repertoire is: Purcell’s Trio Sonata; Bach’s Suite No. 1 for solo cello; Beethoven’s “Eyeglasses” Duo for viola and cello; Handel/Halvorsen’s Passacaglia for violin and viola (or cello); and Dohnanyi’s Serenade for string trio. Later that same Sunday August 16th, starting at 7pm, Christ Church will host yet another sparkling musical event, as the Society of Choral Music (SCM) welcomes the arrival from São Paulo of the Choir of the Colégio Visconde de Porto Seguro. The visitors will sing Mozart’s Missa Brevis in B-flat Major, followed by SCM singing Haydn’s Missa Brevis Sancti Joannis de Deo. Both choirs will then join in a performance of Gabriel Fauré’s haunting Requiem. As always, free entry and exit. More details supplied by the SCM later on in this edition of 4 Corners. 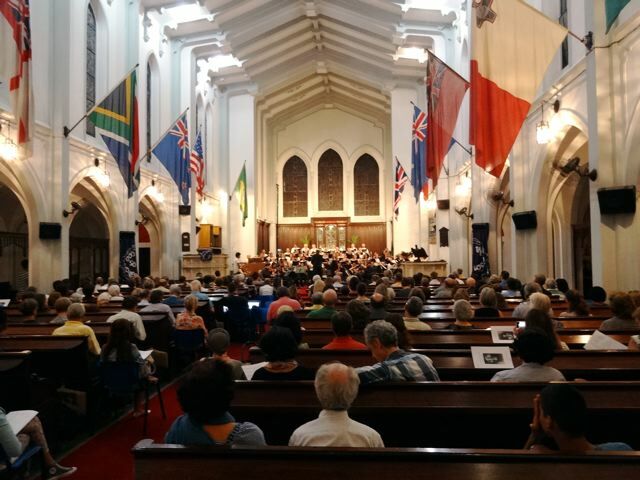 Most years Christ Church is chosen as one of the many venues for the series of concerts known as “RICE” – Rio International Cello Encounter – organized by David Chew and performed by well known Brazilian and visiting musicians. Three times a year the church is packed for the SCM – Society of Choral Music – choral concerts, usually accompanied by the organ, but also by an orchestra if the music demands it. Soloists are both amateur and professional. On most days of the week, if you visit the church in the evening, you will find choirs rehearsing in the church itself, in one of the cloisters rooms, or in the hall. It is not all sacred music, and it is not all English music. On Mondays the main SCM choir rehearses in the church or hall (70 voices take up quite a bit of room). On Wednesdays the “Coral Paratodos” rehearses in the hall, and at times a group made up of SCM choir members and others rehearse Beatles music in the church on Wednesdays, for the BCS – British & Commonwealth Society – Beatles Night. On Thursdays the SCM chamber choir is in the church, and the “Seresta Choir” rehearses in one of the rooms along the cloisters. Every so often the Julio Moretshon choir also rents out the Hall or church for a series of rehearsals for a specific presentation. You may wonder how the Christ Church choir fits in with all this, well choirmaster Ruy Wanderley rehearses the church’s own choir on Sundays, before the 10.30 church service. The British School also uses the church for teaching music, rehearsing and certain specific events such as the Christmas Carol Concert. Many of those who use the church for musical events felt that the visual presentation would be much enhanced if the wonderful stained glass windows behind the altar could be illuminated at night, as they are during the day. This means illuminating from the outside, and the lighting for this sort of illumination is quite special, and has to be designed and installed by professionals. Christ Church ran a successful campaign in 2010 to raise money for this project. In 2009 the church received a very generous donation – a new Johannus Organ, imported from Holland. It was donated in memory of Lucy Jackson Williams, a faithful member of the congregation during her lifetime, and whose family still supports the church in many ways. The organ had not yet been inaugurated, so it was decided to hold an organ concert, both to dedicate the organ and to raise money for the illumination of the stained glass windows. This took place on October 22nd, 2010, when there was a short ceremony of dedication of the organ, followed by the SCM choir singing Benjamin Britten’s Te Deum in C, accompanied by Inês Rufino on the organ. This was followed by recitals by four well known and talented organists, namely Benedito Rosa, organist at Rio’s Metropolitan Cathedral; Eugene Gall, organist at the Martin Luther church in downtown Rio; Lys Gazanego, organist in Christ Church for St Lukes, and Klaus Braun, organist and teacher at the Corcovado School. 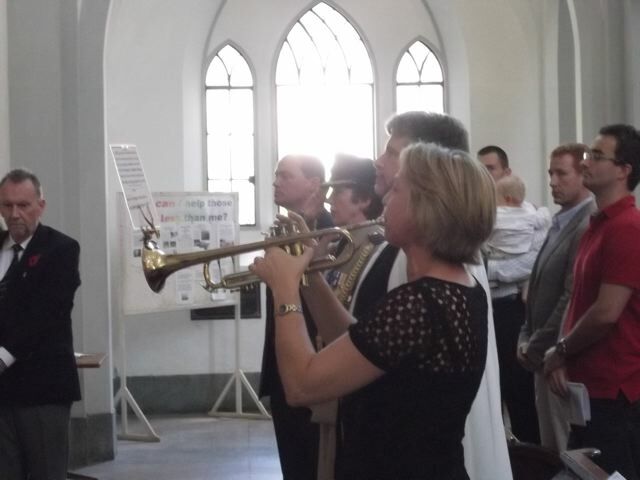 The concert was free, sponsored by members of the church and community to raise money for the illumination project, and was a great success, and was followed by a short reception in the Jubilee Hall. Thanks to the fund-raising campaign, the lighting had already been installed, and at a signal from Chris Hieatt, who was MCing the concert, it was switched on, drawing an appreciative “aaaaaaah!” from the audience. 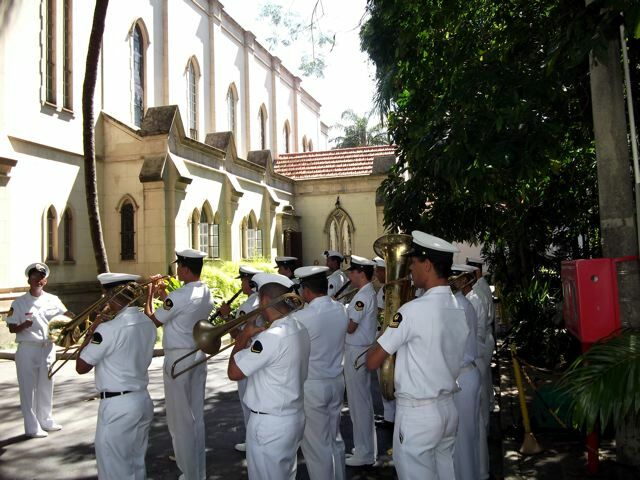 On Armistice Day music is provided from a very different source – the Brazilian Navy Marine Band, who play outside the church while people are arriving, and inside, in the old organ loft, for the national anthems.